I can't remember how this company came across my awareness. I want to say it was shared in the Arcana Addicts group on Facebook. Regardless, once I saw what amazing goodies were inside the October box at Sihaya and Company I bought it immediately. Sihaya and Company makes and sells candles and curates a monthly box that usually follows a theme and showcases various artisan and handcrafted items from a variety of vendors. 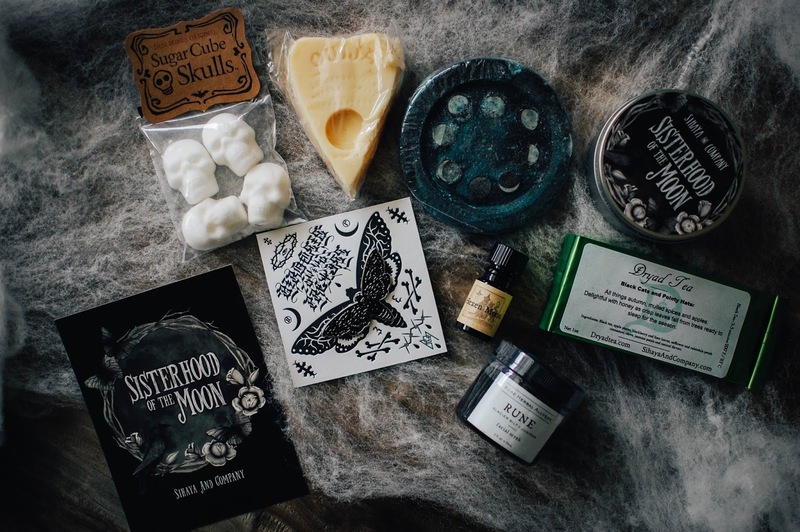 October's box was titled Sisterhood of the Moon and cost $65 plus shipping for 8 items. The box arrived packaged beautifully. Everything was snug and tight and secure. A handwritten note was included and one of the first things I took out was this awesome enamel lapel pin from Bird Ov Prey ($10) called Vein Moth. It has two pins with double rubber backings for secure placement with little movement. I wore it to NYC and my purse strap caught on it often but it never fell off and held its ground quite well. I quite enjoy it and wear it often now. This face scrub and mask combo from Kore Herbal Alchemy ($20) is pretty much everything I want in a face exfoliate. The glacier silt makes for a super fine but highly effective particulate for removing dead skin cells. It smells of chilled juniper. 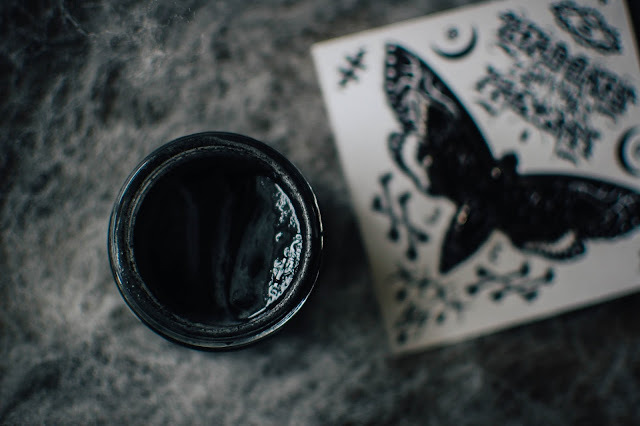 It contains plant based glycerin and activated charcoal. I have used this multiple times and have enjoyed the results and experience each time. I am purchasing this separately very soon to have on hand when this one runs out. 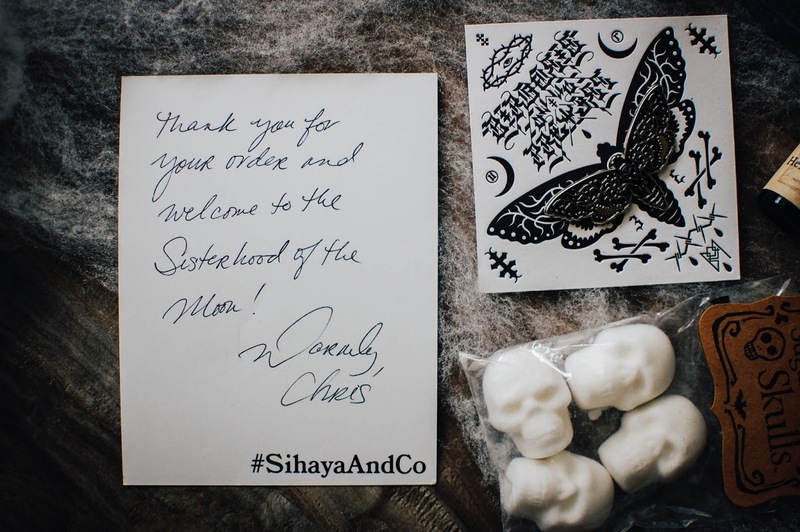 Sihaya and Company usually adds a candle ($12) of their own making to each box from what I can tell. This candle is 8 ounces and is housed in a tin with a lid and lovely label. 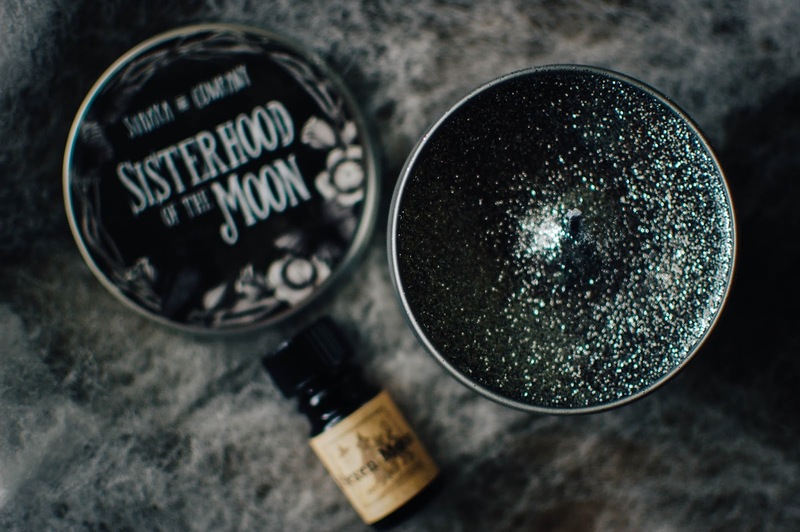 Sisterhood of the Moon- Notes: Amber, crackling fires, woody oakmoss and warm vanilla. This candle burns by my bedside and smells lovely. Not overly smoky but you can tell it is a sweet amber and fire scent. It smells elegant yet cozy. The throw is about medium to medium-light in my bedroom. It is tunneling a little bit and not burning to the edges but it may be that I am not burning it for long enough periods of time too. I light it and burn it for about 3-4 hours when I get home from work until I go to bed. The glitter shimmers and dances when it is lit at night. I am enjoying this candle immensely and will be open to buying another one in the future. Their winter candle scents tempt me. The Potion Cabinet is a bath and body vendor who operates out of Etsy and they included a bath bomb scented in Moon Magick ($6). 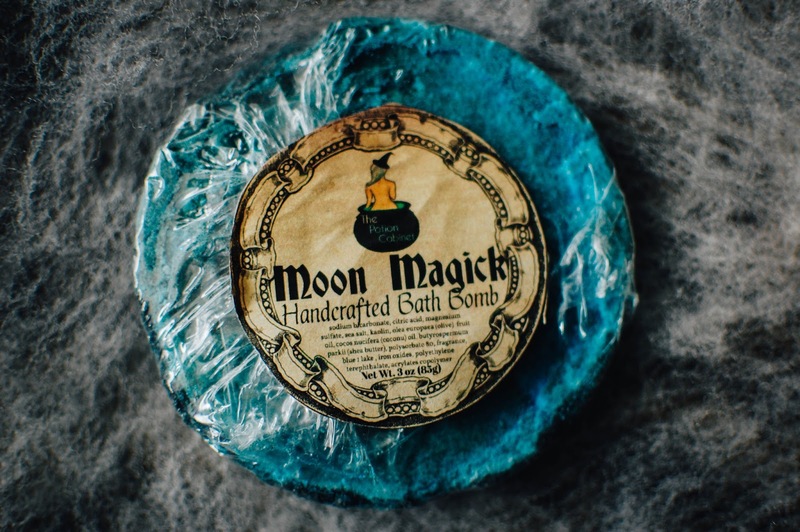 It was an artistic bath bomb of blue and grey with a circle of moons in various phases on the front. I went to open it and take photos without the wrapping and it crumbled hopelessly. I was bummed I failed at capturing it but I just swept it up and plopped it into my bath tub where I enjoyed it all the same. It was a cedar, wood, citrus and musk blend that invoked feelings of serenity and peace while lounging in the warm waters. A vegan lotion bar ($5) in the form of a Ouija board planchette came in the box as well from Sophireaptress. The fragrance reminds me of golden oakmoss, a touch of pine laden lavender and a whiff of earthy patchouli. Smells lovely. And it performs wonderfully as a lotion. I enjoy how these cocoa and shea butter solid lotion bars feel so silky smooth on the skin. I would buy this again for sure. Next up are two items that go quite well together. Tea and sugar. Dryad Tea in Black Cats and Pointy Hats ($6.50) is a black tea blend that combines apples, pomegranates and mulled spices. 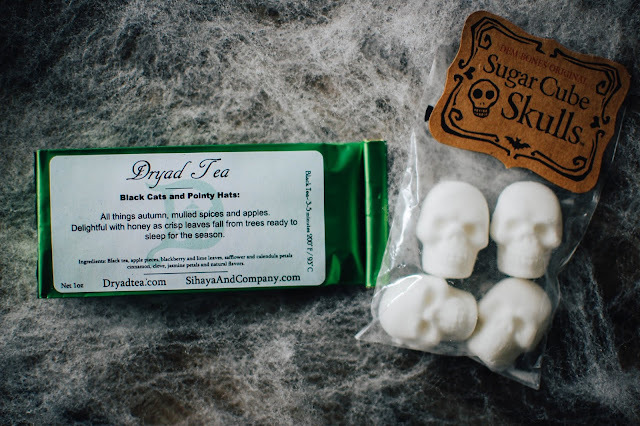 While Dem Bones sugar cube skulls ($3) make the perfect sweetener. You can choose these skulls in either original or absinthe formula. Absinthe formula is a finer grain sugar for use with.. well... absinthe. The original has quite a fine texture as it is and dissolves quite well in hot tea and coffee. I find one skull is the perfect amount of sweetness. I have not had a chance to try the tea yet but I am thinking it will make for a festive and cheerful holiday blend to savor over the next month or so. Now. If I am honest with myself. This is the reason I pulled the trigger so ding dang fast on this box. Julia from Arcana contributed a limited edition scent in Hexen Moon ($19) to the box. 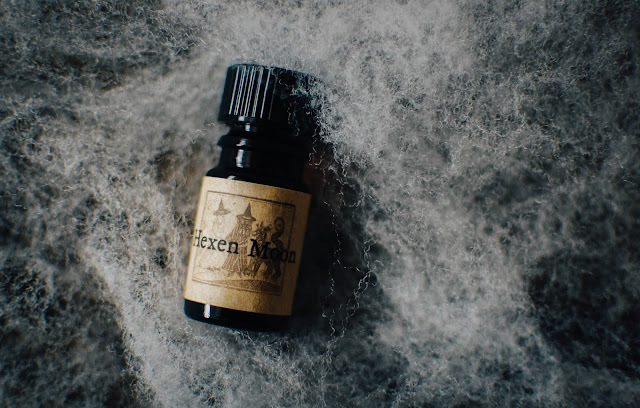 Hexen Moon- Notes: Wildcrafted black spruce, organic vetiver, blood cedar, balsam fir, Port Orford cedar, smoky oudh, bitter wormwood, lightly sugared pumpkin and burning mallow. In the bottle, grassy vetiver with fibrous roots, heavy with damp earth, curl around the edges of the scent. Pressed into the flesh, that earthy vetiver remains and then is joined by cedars growing tall and stout from the grassy earth. These cedars are primitive and stark, sharp and aromatic. After some time the cedars and evergreens are tempered by faint sweetness rising to the top like so much toasted vanilla pumpkin goodness. The sweet is more boozy and heady rather than bakery or gourmand. It is the sweetness in the core of a misunderstood heart. I love the journey this scent takes me on. All in all I am looking forward to following Sihaya and Company much more closely. I tried to snag an Athena's Army box but it fled very quickly as it was a fundraiser for someone in the indie perfume community. I hope whomever it was to benefit is doing alright. I feel the value is well worth the price paid. All the products were high quality and well curated. Would this box be something you would be interested in? What would you look forward to sampling in a box such as this? This box is everything! If I had to purchase a monthly subscription, this would be it. I want to rub my hair in all of those scents, which are so appealing to me. Those sugar skulls are so cute and Hexen Moon from Arcana is just a bonus! I'll definitely be looking into this.